I bought enough miniatures from Khurasan to make all possible Korean armies for DBA 3.0. Below you can see almost all the miniatures painted and then gathered according to the different armies. 1 General (Cv or 4Kn), 1 cavalry (Cv or 4Kn), 1 cavalry (Cv), 4 Spearmen (3Pk), 4 archers (3Bw), 1 archers (Ps). 1 General (4Kn), 1 Cataphracts (4Kn), 1 Son Bae (3Kn or 4Kn) or horse archers (LH), 1 Malgal horse archers (LH), 1 armoured archers (4Bw), 2 long-spearmen (4Pk) or militia (3Pk), 2 militia archers (3Bw), 1 Malgal or other archers (Ps or 3Bw). LH is Chinese because the beautiful Malgal archers came in blisters of twelve but Chinese in four and I only needed two riders. 1 General and Chong (Cv or 4Kn), 1 hwarang (3kn or LH), 1 Cavalry (Cv), 4 spearmen (3Pk), 1 crossbowmen (4Cb), 3 archers (3Bs), 1 archers (Ps). Here I'm using heavy archers as crossbowmen because Khurasan sells them in packs of twelve and I only needed four so I did not buy them. 1 General and Chong (Cv or 4Kn), 1 hwarang (3Kn or LH), 1 cavalry (Cv), 2 spearmen (3Pk), 1 crossbowmen (4Cb), 3 archers (3Bw), 2 red banners spearmen (4Pk), 1 archers (Ps). 1 General (Cv), 1 armoured cavalry with lance & bow (Cv), 1 horse archers (LH), 4 spearmen (4Bw), 4 archers (4Bw), 1 guerrillas (3Pk) or archers (Ps). For this army I needed four more heavy pikemen but again; blisters come in twelves and I was not going to buy it for just four of them. Below a close picture of a general Cataphract. 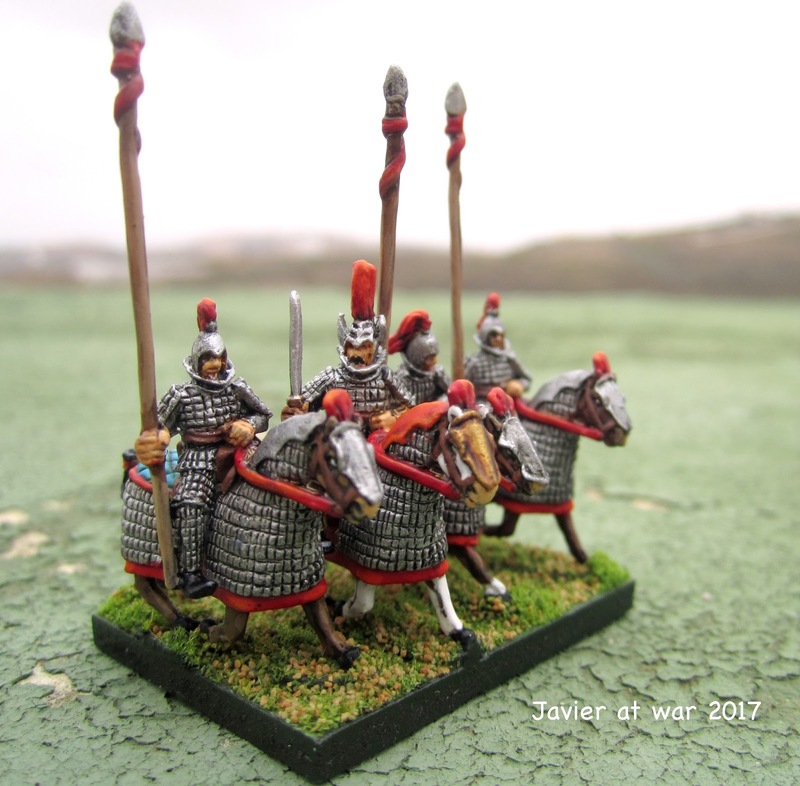 Khurasan miniatures are are nice and quite unique although a bit pricey. A pity they do not sell DBA armies.